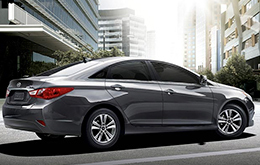 The high-rated Hyundai Sonata has been revised for 2014 and now features over 50 new or redesigned components. Always on the brink of innovation, Hyundai wasted no time upgrading their popular model, which now sports brand-new 17-inch wheels, HID Xenon headlamps, LED taillamps and an updated grille. Major revisions were also made to the Sonata's interior design, technologies and safety functions, keeping the midsize sedan in sync with what today's buyers want and need. Even with all of these changes, the Sonata still offers excellent power and fuel efficiency. The standard sedan provides fantastic horsepower and the hybrid model features remarkable fuel economy Arlington buyers will find beneficial. In an effort to improve the overall driving experience in the 2014 Hyundai Sonata, various changes have been made to the car's interior elements. Each model has received carpet modifications and foam additions to the A and B pillars in order to reduce cabin noise. An optional ventilated driver's seat is also available, increasing comfort, and a leather steering wheel is now standard on SE and Limited models. Technological enhancements, such as a new driver selectable steering mode, automated temperature controls and an available touchscreen display with HD Radio and a rearview camera, provide more functionality across the lineup, while a new blind spot detection system and a blind spot mirror addition work to increase safety. Two powertrain are offered with the 2014 Sonata: a 2.4 four-cylinder and a 2.0L four-cylinder, available on SE and Limited. The standard 2.4L engine works alongside a six-speed automatic transmission to achieve 190 horsepower and 179 lb.-ft. of torque, while the 2.0L engine produces 274 horsepower and 269 lb.-ft. of torque. Each variant is efficient, but the 2.0L is a little bit faster - it can hit 60 mph in 6.7 seconds. 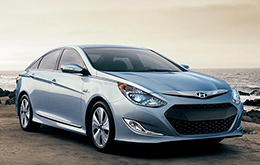 If fuel economy is a major concern, the Sonata Hybrid, praised in several 2014 Hyundai Sonata reviews, is your best option. Its 2.4L engine can exert 159 horsepower and it comes paired with an electric motor, which helps lower gas mileage and increase efficiency. 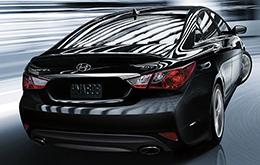 Would you like to learn more about the 2014 Hyundai Sonata in Arlington? Continue reading below for exclusive specs and photos. If you've ever thought about purchasing vehicles like the 2014 Ford Fusion, Kia Optima, Toyota Camry, Mazda 6 and the Nissan Altima in Arlington, compare Hyundai's new 2014 Sonata first; we're sure that it's the right fit for you. The Sonata's got several notable attributes, including its user-friendly incar technologies and marvelous styling. Compare its price to the aforestated list of vehicles and you'll see that it's a truly amazing value, which is one of the main reasons why so many Arlington drivers select it. The bullet list below this paragraph will give you even more info about its specs! We know your next Hyundai purchase is important; that's why we've provided the 2014 Sonata review above, along with reviews of previous year models. We are a prominent Hyundai franchise in Arlington, and it's our responsibility to equip you with reviews written by some of the best automotive writers in the industry. The above article is jammed with accessible information - it contains info about cabin features and other specs so that you can make sound decisions about the Hyundai you want to buy. Is the Sonata not the right pick for you? Discover more about other vehicles offered by Vandergriff Hyundai using our reviews archive. 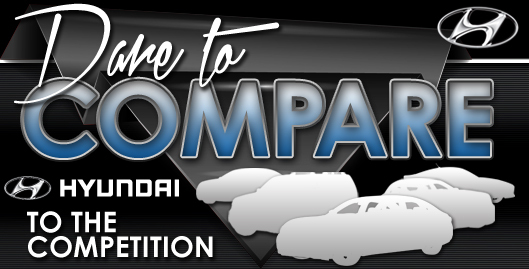 With it you can review and compare Hyundai's entire portfolio of vehicles.